A few days ago, friends and I skied the Tower/Chittenden Loop in Yellowstone National Park. It was a lovely day, cloudy with flurries but not too cold. 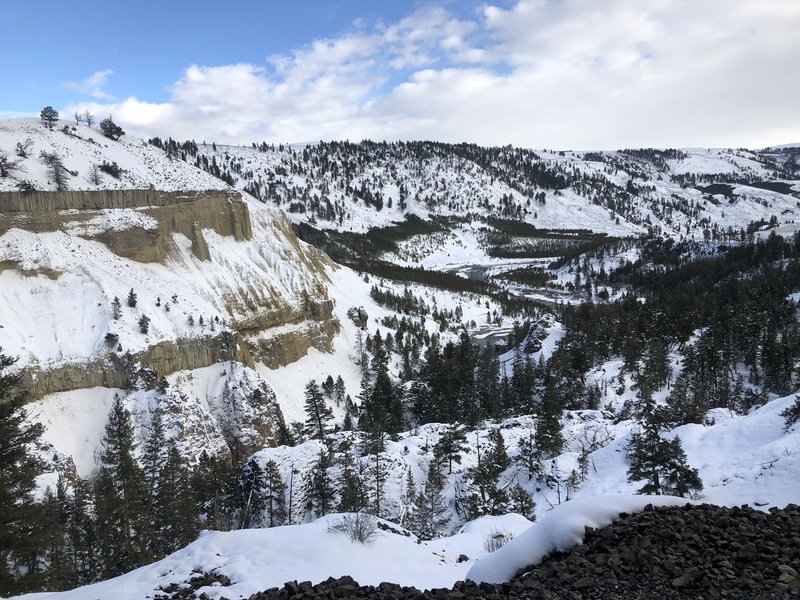 The day before, I had skied the Snow Pass/Bunsen Loop just outside of Mammoth Hot Springs in the Park. Both trails are easily accessible from the year-round roads in the Park, and maps are available in the Mammoth Ski Den. I write about these places and don’t hesitate to state where they are and how to get there. I’m willing to share my experiences and encourage others to enjoy these trails. But, I’m less willing to give the exact location at any point in time for the wolves I observe. Or the otters. Or the coyotes. I am less willing to share the exact location of some of my off-trail hikes. I am less willing to share the location of some special but fragile areas. Last autumn, my stomach tightened as I thought about how I should word my posts on Facebook as we traveled and hiked new places. And I wondered about that tightness. Why shouldn’t I share exact locations and directions? What is the difference between sharing a well-publicized trail in a national park vs an off-trail or more obscure fragile area in other public lands? So, I’ve considered. And lo and behold—a message in my Inbox directed me to a few sites that address this concern. Abbie Barronien in The Adventure Journal has a brilliant post on this topic. She puts into words many of my concerns about publicizing exact locations of sensitive areas, and gives suggestions as to how much information to share and on what sites it might be appropriate. It is not selfish. I am not elitist. But I am worried about our over-populated species ‘loving it to death’. Most sensitive areas that are not in a national park (and even many that are) just do not have the oversight protections necessary. It is too easy to show up and trample fragile plants through ignorance or even worse, to purposely deface a natural feature and get away with it. There are no easy solutions. We balance on a fine razor’s edge with wild lands. On the one hand we want all to experience and to fall in love with wild lands, to have a transcendent experience and return home to protect what they love. But we don’t want the landscape over-run and destroyed so that visitors feel a closer connection to Disneyland than to the ‘real world’. If we really want to travel the trails less traveled, then we should be willing to pay for the adventure. We pay by doing research: buying books, researching photos on line, communicating and asking questions. But even better: stumbling upon a unique place all on our own. It is so much more powerful that way. An eighth Leave No Trace principle would allow us to be more circumspect in our postings and have it accepted by others. It would give permission to be more thoughtful in how we post what we post. And it would bring more awareness to us all of the importance of our words. These principles are not rules, but values. As a nation, we hold the value of wild public lands dear. As times change, our values change—it is time to add a social media value to Leave No Trace. 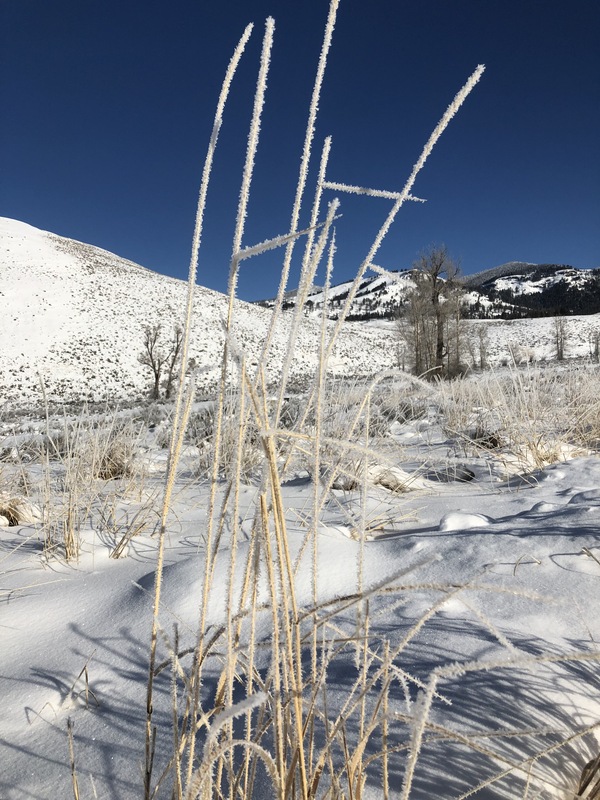 The morning after Christmas, we drove through the Lamar Valley. We were alone on the road, the weather snowy and cold. One of our group noticed ravens in a tree. We’d learned that ravens can be an indicator of predators in the area. Immediately after noticing the ravens, another member pointed out an elk on a cliff, her back to the edge, facing upslope. Just above her we spotted the Lamar Canyon pack—three black wolves who were obviously going after the elk. We found a pull-out, pulled over and silently got out our spotting scopes. The wolves began to move off at the sound of our vehicle but they stayed in the area and made a kill after sunset that night. While we’d seen wolves each day, this was the memory we’ll take with us… it was our own sighting. We paid our dues of getting up early, deciding the direction to travel, and closely scanning the terrain. This is what the eighth LNT principle is about—and it makes the experience powerful enough that it can change lives. It changed my life. So keep going to wild places. Keep exploring. Get out there and hike and ski and wander and take photos and appreciate silence. Love our lands, love your time on our lands. And be mindful of how you share your adventures. LNT has always been a tenant of outdoor exploration for me. Growing up my mother kept my brother and me to the trails so we didn’t damage the sometimes sensitive ecosystem. We never left any trash, but we also shared where we were going with anyone who was interested. Now that I write about these places and share where others can enjoy the same hikes, your post has me wondering whether I should include warnings about sensitive plans, soils and otherwise with these posts. Perhaps if the area requires care to the degree that many won’t take these steps it s better not to share where the trailhead is so that they have to do the research themselves. You make a good point, Tobias. Beautifully written and excellent thought fodder! The wild’s most transformative moments – those intimate, sacred, breath-taking glimpses are earned through physical, emotional and spiritual investment. Inspiritation through perspiration. A teaching moment all the way around. Moving words. As I watched the ravens, elk, and wolves through your eyes, I found I was holding my breath. As I read the last quote, my eyes dampened. As I read about pictures and postings, I saw, again, these careless, thoughtless, even malicious people taking selfies with bears, touching bison (and getting away with it unharmed), walking off-boardwalk in fragile thermal areas. Yes, Julianne…this is an important addition to LNT, to the way we care for our beloved planet. Thank you. I can’t tell you how excited I get when I see a post from you Julianne. This post was so interesting for me and took me back to when I was writing some posts about my Yellowstone experience last summer. Since your hiking class that I supported was all off-trail I made a conscious decision back then not to post about it. I wasn’t sure if I was just being a bit silly about my approach but now I am glad I didn’t write about it. I would love to discover other hidden places within Yellowstone with you if you have the time this summer. Lovely post, lovely images. Can’t wait to get back there. Can’t wait to explore more hidden places with you next summer, LuAnn! 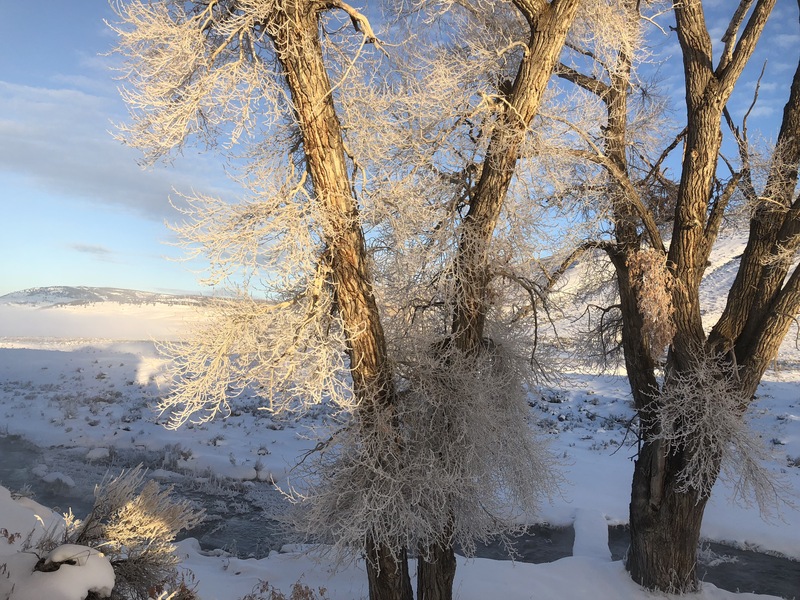 As one of the people who started the 8th LNT group, I can’t tell you how heartwarming it was to read this post and read about your experiences with wildlife and wild places. Thank you for writing about the idea of social media ethics in regard to public lands and for so thoughtfully and articulately advancing the conversation. Thank you for your kind words, Mark. It seems like LNT needs a small nudge in this direction…. I am so glad that I happened upon the 8th LNT WordPress page.